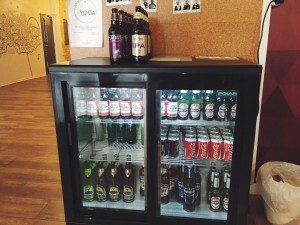 One of the best things about being a web developer in Newcastle is the fantastic community we have. As a web developer, there are an almost infinite number of new technologies, skills and techniques you can learn, and the community is very supportive: there are regular, free talks on a huge range of subjects throughout the North East. Last week, Frontend North East held its very first event and received a massive turnout of 50 web designers and developers at Campus North, who very generously host a lot of these events free of cost. Peacock Carter were proud to sponsor the event in the form of some refreshment for the attendees, alongside HurstDev who provided a lot of pizza. We get a lot out of these events – we learn, and we share ideas, so it’s only right we put something back in the community! With beer and pizza, how could the event get any better? Well, we had two great talks on web technologies to improve our productivity and quality of our work – firstly, a talk on using SCSS, and secondly, a talk from fellow organiser Martin at TemperTemper who spoke on using Susy for web layout. Thanks again to all those who came, and we look forward to seeing you at the next event!